When I went to the recent Bonhams Auction, they made mention of an addition to their calendar of memorabilia sales, by including Goodwood! Their plan is to have the viewing at their Bond Street showroom, which I will go along to, but I doubt I will go to the sale itself, as now they have released the catalogue I can’t see anything I want to bid for. 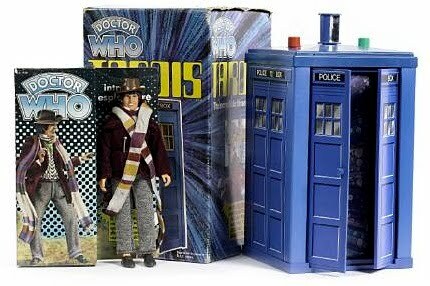 Here are the few Doctor Who items on offer. 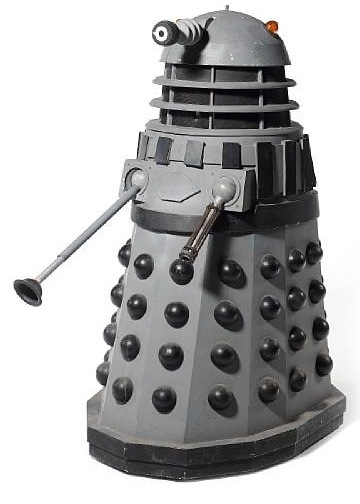 The vendor states that this Dalek has been altered and parts refurbished, reused and replaced throughout its existence. The eye stalk was used in Rembrance of The Daleks, 1988. The dome piece of this lot was used during the 1970s/ early 1980s. 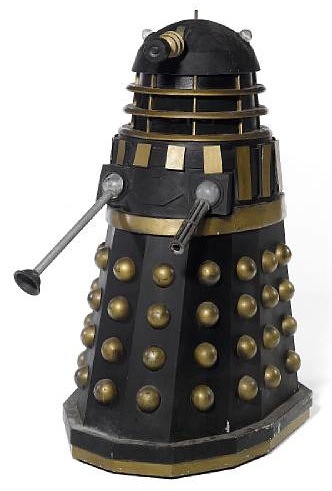 Part believed to be from the 1970’s to Remembrance Of The Daleks, 1988, A Dalek, repainted, re-furbished and reused on numerous occasions, of fibreglass, wood, metal and plastic construction, painted black with gold hemispheres, slats (7 slats missing), plunger arm and eye-stalk, dome lifting to reveal interior with wiring, mechanism and seat, on wheeled base, height 65 inches, width 25 inches and length 44 inches. 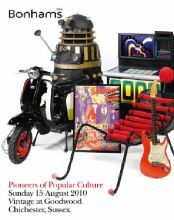 The vendor states that: “The top of the dome from Resurrection of the Daleks filmed September 1983 and transmitted 1984. Present owner worked in workshop, on location and in studio during production of this episode. This particular Dalek has also featured in many Doctor Who exhibitions and books, with a final major refurbishment for an on-screen appearance at The Children's Royal Variety Show 1994 in front of Princess Margaret, in aid of NSPCC. 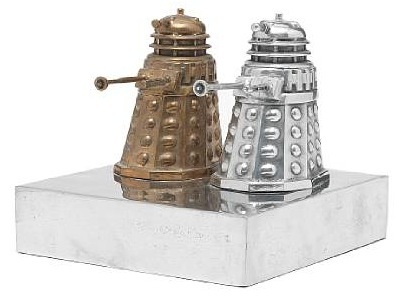 Clive Barker (British, born 1940) ‘The Emperor and His Wife’, 1999 stamped and numbered 9/9, polished aluminium and polished bronze 21.5cm. I love the way theis item makes no reference in the text to it being a pair of Daleks! Earlier on in the sale is one item of Doctor Who toys.